As our climate warms and the frequency of very hot days increases, the risk of plants being damaged increases too. It’s good to start thinking about this before the really hot days hit so that you are ready with your defences. There are some simple, sustainable and cheap methods of giving your plants some protection – you don’t need a special shade house, just some ingenuity and a bit of forward planning so that you are ready when the heat arrives. For some plants, high temperature alone, without direct sun, can be sufficient to cause wilting and even death because of evaporation from the stomates (pores) in leaves. However, if you can give plants a good watering before the sun rises, or the night before, plants will take up moisture and be more resistant to the day’s heat. Watering systems which deliver water to the ground rather than leaves are preferable. You may need to water the ground again during the day, but make sure water does not get on the leaves because that can induce scalding as it evaporates. We probably don’t need to say this to a sustainable gardener, but be sure to cover the soil and irrigation systems with a thick layer of mulch. This will shield soil from sun and reduce evaporation from the soil surface. Most Australian native plants and Mediterranean plants, such as rosemary and thyme, can withstand high temperatures as long as they have some water. It is really vegetables, fruit trees, vines and tender annuals and shrubs which need extra care. 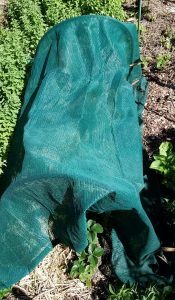 Garden centres and nurseries usually use shade cloth screens which can be rolled out over plants during the day. You could opt for that in your garden or buy a ready-made shade house. For occasional heatwaves, however, it is much more sustainable to use methods which are versatile, demountable, use recycled or natural materials and are easily modified. Temporary shade can be created by attaching shade cloth to systems of stakes over plants in direct sun. Plants receiving afternoon sun might benefit more from having a shade cloth screen on the west of the garden bed. If there are handy walls or fences, you can suspend shade cloth from them to stakes in the garden. The colour of the cloth is not always the best guide to its shading capability, so look for 50 – 90% shading. For vegetables and fruit trees 50 – 60% shading is usually adequate, but for sensitive and ornamental plants, 70 – 90% is needed. 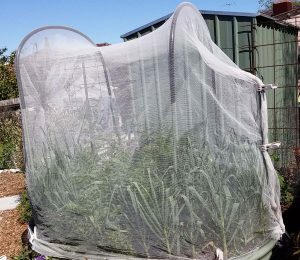 Fine netting used to protect plants from birds, possums, rats and certain harmful insects also contributes some shade – generally 18 – 20 % shade. It also reduces the effects of wind. Its use, thus, has multiple purposes and, on extremely hot days, extra protection can be given by clipping shade cloth on as well. The picture at the right shows use of fine netting on vegetable beds. Constructing frames specifically for shade does not need to be expensive or difficult. And it can be really sustainable if you source materials from tip shops, op shops or your own castoffs. Relatively short lengths of polypipe slid over bamboo sticks are very inexpensive, easy to assemble, portable and easily adjustable. An example is shown below at the left. We have found that short, thin bamboo stakes available from hardware stores are just right. Attach some polypipe of appropriate diameter (it doesn’t need to sit tightly) to make a hoop leaving some bamboo exposed at the base. Clip shadecloth to the bamboo using ordinary clothes pegs (they won’t fit on the slightly wider polypipe). The biggest expense here is the shade cloth, but you can re-use it year after year, or you might find some at the local tip. What about old curtains or sheets? Using such materials is an excellent way of repurposing cloth. If you don’t have any, ask you mother! Or visit and Op Shop – they usually have a lot at very reasonable prices. You could drape them over frames or just hang them over shrubs. However, since in many parts of the country, heat is often accompanied by strong wind, it’s a good idea to peg them down. Get out the beach umbrella as well as those you use for rain. With the aid of some stakes or bamboo sticks these can be placed strategically. Sun beating down on the side of a raised bed, particularly if made of metal which conducts heat, can lead to hot soil. 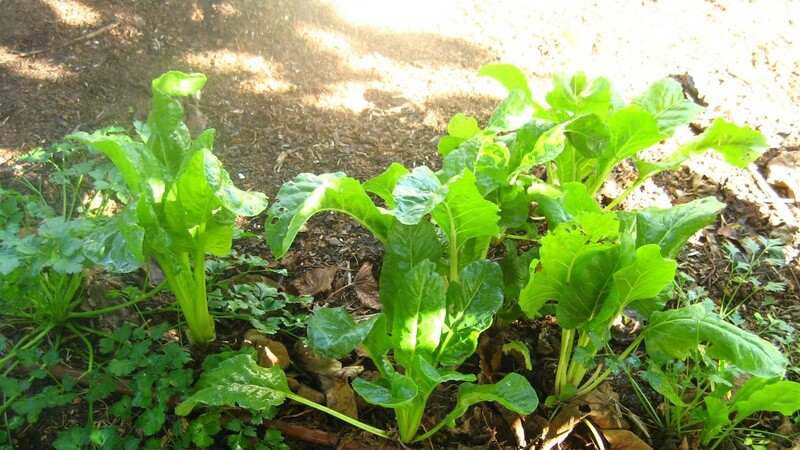 Try growing heat tolerant plants on the outside of raised beds. In the picture on the right are Plectranthus and Limonium (Statice). Keep them pruned so they grow tall and sideways rather than outwards remaining close to the edge of the bed. Don’t grow plants which have underground runners like marjoram or yarrow – they will migrate under the edge into the bed, steal nutrients from the soil and be difficult to remove. If you don’t like the informal look in the picture, you could try growing a narrow hedge of something useful like myrtle Myrtus communis – it is easy to grow and can be pruned to shape. And its peppery berries can be used to flavour roast chicken or pork or infused in alcohol for an interesting tipple. Find shady spots under shrubs or trees to temporarily place potted plants. You could even take them inside the house for the day. 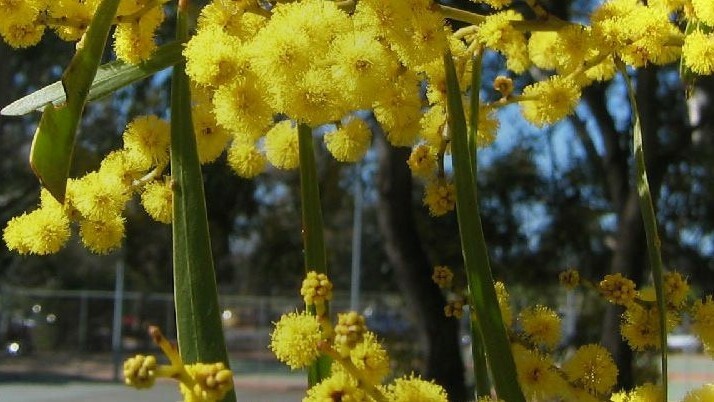 Resilience to extreme weather is improved by healthy plants which have adequate nutrition and water. And healthy plants are what you wanted anyway!